Even the meat-eaters are going to love this Vegan hot and sour soup made in the slow cooker! Click here to see The Top 20 Vegetarian and Vegan Slow Cooker Soups! Click here to see all the Slow Cooker or Pressure Cooker Soup and Stew Recipes! It may be spring, but I know in Utah we’ll have a few more cold nights and maybe even some snow. I think Kathy’s Slow Cooker Hot and Sour Soup from Fat Free Vegan Kitchen sounds like a nice season-spanning dish. It’s light, which fits our mood at this time of year, but Slow Cooker Hot and Sour Soup is warm and comforting if the spring weather is on the chilly side. 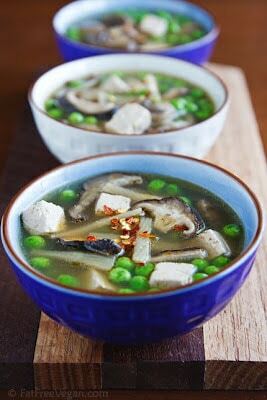 Get the Complete Recipe for Kathy’s Slow Cooker Vegan Hot and Sour Soup from Fat Free Vegan Kitchen. Click here to see all the Slow Cooker or Pressure Cooker Vegan Recipes that have been featured on this site! That's a really cool recipe. I love that one. I'm not vegan but this soup looks great.